The Top 30 ranking in Germany shows once again that Germans like to shop in their supermarkets. 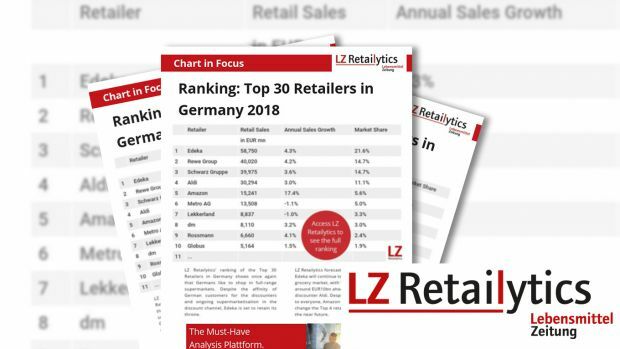 LZ Retailytics’ ranking of the Top 30 Retailers in Germany shows once again that Germans like to shop in full-range supermarkets. Despite the affinity of German customers for the discounters and ongoing supermarketisation in the discount channel, Edeka is set to retain its throne. Despite remaining a threat to everyone, Amazon will not be able to change the Top 4 retailers in Germany in the near future. The planned expansion of Amazon Fresh, which was anticipated as a threat for the German market, is not happening so far. However, pressure is building for smaller retailers and some of them already surrendered.